Fumigation is the introduction of a gaseous chemical in an enclosed space for the elimination of termites, wood boring beetles or other pests. Fumigants penetrate cracks, crevices and pores in the wood and therefore are ideally suited for the control of wood destroying pests that other types of pesticides cannot reach. Sulfuryl Fluoride was developed for structural fumigation. It is non-flammable and non-staining and will not react with items or components in the structures. Because Sulfuryl Flouride is colorless and odorless, a vacating agent (tear gas) is necessary to ensure that all people and plants are out of the structure before the gas is introduced. The first step is to completely seal the structure. This is done to contain the fumigant in the structure so it can penetrate wood and construction members to eliminate the pest. Depending on the construction of the building, the doors and windows may be sealed with tape and a plastic sheet. It is more common for the structure to be covered with tarps. The structure will remain sealed for 32 to 48 hours, depending on the specific conditions of the job and the type of pest. Warning signs are posted around the building notifying people that the property is being fumigated. A guard is posted at the structure to prevent tampering or entry. 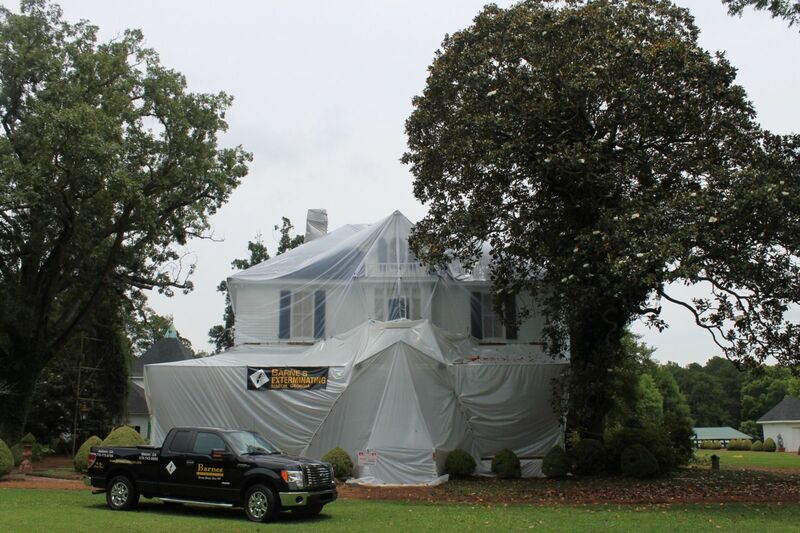 After the tarps are removed, a fumigator will aerate the structure by opening the doors and windows. Fans will also be used to aerate the building. Once the structure has been thoroughly aerated, a trained fumigation professional will measure the level of fumigant remaining to ensure that it complies with label requirements and state and federal guidelines.